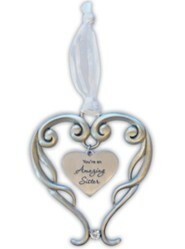 Hand crafted metal heart ornament features engraved heart center and genuine crystal accent. 4" on white ribbon; You're an Amazing Grandma. I'm the author/artist and I want to review You're An Amazing Grandma Heart Ornament with Crystal Accent.